We are Transformed through Creation, as it elevates our Consciousness to the Truth of a Divine Correspondence. We learn to Know and Believe through the Miracles of change manifested in our Life. In small, incremental steps, our Faith is elevated to Believing. Mother Earth was given to Human as a living illustration of an unseen Universe of Spirit. Our Connection between the Above and Below is illustrated by Earth’s connection to the Powers Above. The movement in the Earth’s core of molten iron, creates the geomagnetic force that grounds us as a force of gravity. We attract the Lightning Forces above. Both Human’s Mind and Heart are One in a Connection to Spirit Above. Our thoughts are the electrical impulses, drawn toward Higher Thoughts Above. Our Hearts are magnetized by the Earth’s movement. A Quickening in our Heart is the result of the iron in our blood, when it is ignited by the electrical Spark of the Creator’s Love. Flint/ETZNAB’s intention is to offer us a Truth we will believe. 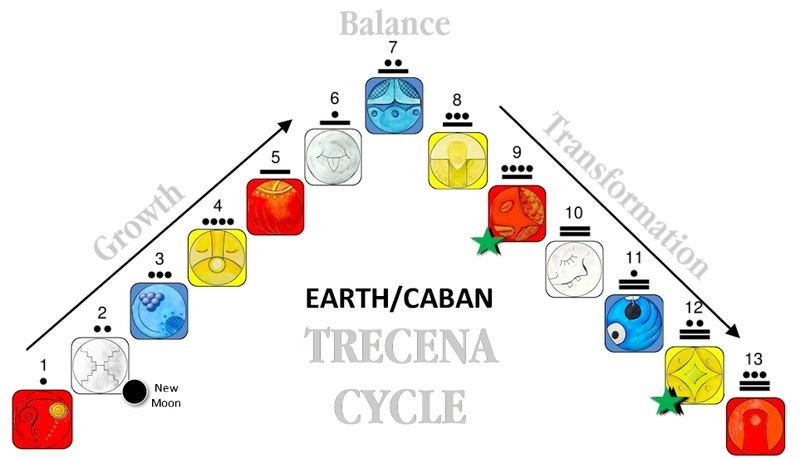 Under the Guidance of Earth/CABAN we are called to believe in the Truth that is shared with us by Mother Earth. We are Inspired to take a Leap of Faith in believing that the Beauty of her Design was Intended by a Supreme Creator. Humans are made of all the Elements of Mother Earth. In order to Believe that all the Forces and Magic we see in Her are True in a Spiritual Universe within, we are asked to Choose our own Leap of Faith. In the realm of Spirit changes happen at the Speed of Light. The Ether of Spirit, like Lightning, exists as an Unbridled Power that knows no boundaries or limits of time or space. In the realm of physicality, the evidence of creation takes longer to see. Creation will always require us to believe in a Vision in Spirit by Faith, before it can be manifested on Earth. Creation is a back and forth correspondence with the Creator. We begin to Know our Spiritual Identity as we manifest the Consciousness of a Divine Relationship. Our “conversation” was started by the Creator, as we were Inspired by Divine Thoughts. We are given a point of comparison. As our own thoughts are drawn to how we are different, through our thoughts we share back with the Creator a Truth we believe about our Self. The next response from the Creator is always the sharing of Unconditional Love. We are always loved just as we are, though through this exchange of Love ignited in us is the Passion to be something more. We are inspired to be more by the Love we received. We can Choose to be More because we Know we are already “enough.” It’s a Choice because it wasn’t necessary to Know the Love of the Creator. Flint’s Truth is unexpected. There are many ways that Flint reveals the Truth. It’s mission is to reveal Truth that was hidden or covered up. Flint represents the Sacred Flint Knife that cuts to the heart. Flint is also known as Mirror, like the Obsidian Mirror that was used for Divination of Truth, and holds a perfect reflection of things as they really are. Both are symbols of Lightning Thoughts of Truth. Flint strikes a spark, and Obsidian is a stone created by Lightning’s connection to Earth. The Intention of Flint’s Truth is to sweep away the false truth that stands in the way of our own Discernment of the Truth of the Creator’s Love and our Power to Create our own Reality. Flint’s Lightning Strike of Truth generates a new path for our thoughts going forward. Flint is said to present us with a temptation to act out of character. Our “out of character” behavior is the “hidden truth” we try to cover up. Flint’s Truth can be the thoughts of “unworthiness” we hold in regard to our Human limitations. We can deem ourselves unworthy of the Power we Dream of. We can be convinced we have to be Perfect for the Creator to fulfill a promise of Divine Justice. We see our limitations and failures as the Truth of Consequences to our future happiness. Today as we are given the Choice of a new Intention of Faith, Flint/ETZNAB can present us with a new reflection of the Truth that our Divinity Lies in the Choice. Our Human limitations can’t hold us back when our Intentions are Divine. The very fact that we long to be part of a Loving World, is the Creator’s evidence of our Expression of Love that we would hope to exchange for the Unconditional Love we are given. In my journey through a decade of financial setbacks, I was fearful about my means of transportation. My car was on its last leg. I miss her now. She served me well. Every electric window had failed over the course of my ownership. Upon their second round of “falling down” I resorted to taping them up. I drove for more than a year with 3 windows taped up. Under the hood a helpful mechanic also spared some expense with some duct tape that finally ended the water that was somehow leaking in to the passenger’s side floorboards. There was always a pool there after it rained. I had little resources to bless her with, but I gave her all my love for all the miles she’d managed to carry me. I remember how grateful I was that the one window that worked was the driver’s window, which allowed me to negotiate all the fast food drive-up windows. All my brokenness was evident for the world to see from the outside. While Miracles of change were happening on the inside. It was only when she finally broke down that I realized I never chose to dream of something better. I never realized my car was firmly planted as a Truth of impossibility, too impossible to even imagine to create. The newer car was a Miracle of Transformation that manifested its own Truth. It was the first major physical evidence of a transformation within. I could only see it as a Miracle of Divine Justice, a Gift beyond my own imagination. The new Miracle that manifested by Spirit in a new round of transformation was an unexpected opportunity to refinance the car from 27% rate to 4.3%. On 3 Transformer/CIMI in the last trecena, my only intention when I walked into the Credit Union was to see if I could negotiate a Credit Card that I could use for the purpose of travel, hoping to secure it by a savings deposit. On the spot they approved a card without savings and offered to refinance the car. It was the first time I was seen worthy of credit in more than a decade. God’s Miracle overcame more than a decade of personal setbacks. Impossible was proved possible without ever asking for the blessing. I see it as a Gift of Divine Timing. Today I hold a different set of values. I have no need to spend money I spent before to maintain a worldly image. All I need to be happy today is a roof, something to eat, and a warm bed at night. Today I ponder the idea of wearing my own “uniform” that defies the voices that tell me I have to be seen wearing the latest trend. (Think how much money we would save if we chose our own style that didn’t have to change?) Think of all the savings of paper catalogs, and fashion commercials and unrealistic aspirations of “beauty” that would no longer be necessary. Think of the beauty we could define by our own creativity. Just imagine all the resources we could have at our immediate disposal, if we were no longer subject to choices that are imposed by the world. Within our own choices we hold the Power to Change the world around us. Imagine how much money that Mark Zuckerberg must save by making his “uniform” a t-shirt and pair of jeans. Imagine all the choices that are no longer necessary when a relationship with the Creator becomes our most important Intention. Through our choices, we share with each other the Consciousness of their own Sacred Right of Choice. That car was a Gift to my own Consciousness and Compassionate Love of others. I could see how inaccurate our characterizations of one another can be when discernment is made on outside appearances. I will never see someone driving a beat-up car in the same way again. Today, when my attention is drawn to such means of transformation, I send a Blessing and Wish that the driver is blessed with the same Miracle that I have known. I see the Spirit of the Human, aside from their car. Flint/ETZNAB can bring to Light the Dream we thought was impossible, and sweep it away with the Truth of ALL Possibility. Flint can reveal the “worldly false truth” that we’ve been holding onto as the proof of impossibility. Flint’s Truth is totally unpredictable, capable to reveal itself in many ways. Flint is also capable to deliver Truth as a “stroke of genius.” We can receive Truth that was right in front of us all along, a way forward with a Dream through a “lightning strike” of genius. The Highest Truth that Flint can deliver is the Truth of relationship between the Above and the Below. A “lightning strike” of Divine Consciousness can hold the Truth of ALL possibility. Flint/ETZNAB is a day when caution is advised through Consciousness of our Thoughts. Flint WILL make it’s Truth known, one way or another. We can learn the “hard way” by acting out. Or we can avoid unpleasant consequences, by catching the thought before we take action on it. This is a day when others are bound to reveal their truth to us. One of the characteristics of those born Flint is that they are capable to see beyond the false truth of others. Flint sees beyond the words that are spoken to the True motive of the communication. On a day of Flint you might notice your own Gift of Knowing the Truth behind every Human interaction. Flint can expose our inner darkness to one another. This is a day of compassionate tolerance and understanding. Our Forgiveness can heal many wounds. Through our own discernment of Truth, we are given the Choice to follow our own way. On Flint/ETZNAB, thought a lightning connection to the Creator, we are given the gift of Knowing how our Truth Feels. Flint can reveal a Truth we already knew, but didn’t believe in our self enough to claim. Through the Discernment of the Creator’s Love we hold an unlimited opportunity for Miracles in our Life. When we Choose to Believe in a Divine Creator that knows us better than we know our Self, we can be blessed with Miracles we never knew we dreamed of. We can see that through the Choice for Divine Will, the Creator can choose the Miracle that will carry us the farthest distance from Faith to Believing. To all my relations, as we are presented with a new Truth may we be present in the moment so we can remember how Truth feels to us. May we identify within our self, that gut reaction of Knowing that doesn’t need any physical evidence. May we discern this experience of Truth as our Direct Connection to the One Mind of Divine Consciousness that Knows the Truth of Everything. May Flint lead us to a new Truth we find worthy to believe, enough to make a Leap of Faith. May we believe in a balance of Power between the Above and the Below, and the Truth of a Correspondence that is always offered to Human through a Choice and an Intention to Know it is True. May we be gifted with a Truth we can stand on to believe in the Miracle that will be manifested on Mother Earth, to be seen by Human Eyes in our future. I’m grateful for magic of the Creator’s Divine Designs, and the Truth that all things are possible when we Choose the Dream of Divine Will.